Manufactured with a permeable wipe clean cover and filled with fibre, this commode cushion is extremely comfortable and can fit the majority of commodes. The cushion is held in place on the commode with hook and loop ties. Manufactured with a permeable wipe clean cover and filled with fibre, this commode cushion is extremely comfortable and can fit the majority of commodes. 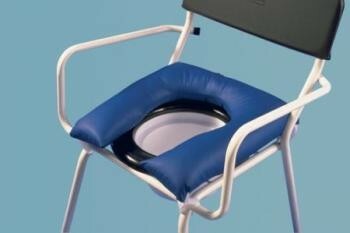 The cushion is held in place on the commode with hook and loop ties. Size 450 x 450 x 50mm (18 x 18 x 2").